When I was a boy, my grandparents lived just down the street, and my brothers and I would visit them almost every day. It wasn’t uncommon that we’d find them at the table, holding hands or occasionally even slow dancing in the living room. 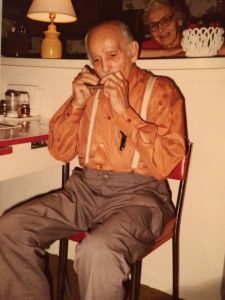 Since our grandfather was a musician and both of them loved to dance, they were usually good sports when we would retrieve Grandpa’s harmonica from his drawer and request a song. Grandpa would take the harmonica and wipe it off with his pocket-handkerchief. After moment’s reflection, he would announce the song he was going to play, usually followed by a little story to explain its meaning. Then he would hit a couple of notes to find the key and begin to play. Soon, as if on cue, grandma would stroll in from the kitchen and for the next ten minutes or so, until grandpa got winded from playing the harmonica while simultaneously dancing the waltz, they seemed to enter a place reserved for just the two of them. I could only describe it as a place of pure joy and love. Our grandparents met soon after our grandmother, Agnes, then twenty, immigrated to Chicago from war-torn Poland. She had been in love once before, but that dream was left shattered on a battlefield during World War I. Soon after the war ended, she left Poland for a chance at a new life in the United States. With the help of other immigrants, she found a place to stay in a boarding house. Then, she found a job preparing salads and cold appetizers in a well-known hotel. The handsome Swiss Chef, who ran the hotel, showed an interest in her, but as he had somewhat of a reputation as a ladies man, she let it be known that “she was not that kind of woman” and was not interested. He persisted and over time, with the promise that he had nothing but respect for her, he gained her trust. They began to take walks together and meet for coffee. Grandpa was a great storyteller and explained it like this; “I went out with a few woman before your grandmother, in Switzerland, France and then England before coming to the United States. But Agnes was different. Because of the war she never had an opportunity for a formal education, but she possessed an inner strength and dignity that ran deep. Her family was Catholic. While her mother died when she was very young, her father was a deeply religious man who worked for the local Church. It was her faith, above all else, that she brought over to this country. This and the principles she stood for taught me to desire more than her outer beauty. It taught me to desire and come to know her inner beauty, as well.” He went on, “Jackie”, he said, “it often takes a real woman to make a man a man. You see a man comes into the world with two wolves, one on each shoulder. The first wolf is like a knight in shining armor, ready to do battle and to sacrifice it all to defend the beauty, honor and dignity of a woman. The other wolf sees the beauty of a woman but grasps at it, he wants to take and use her beauty for his own pleasure and gratification. These two wolves will battle each other for dominance.” “Which wolf wins Grandpa?” I asked. “Whichever one you feed,” he replied. I owe a debt of gratitude to all of my grandparents, who despite tremendous obstacles (three of the four were orphans) showed our family a huge capacity for love.